On a typical morning, my mother, Camelia Maribel Sanchez, drives 15 minutes from our house in Coachella, a small city in the Southern California desert, to the bell pepper fields in the town of Mecca. By 6 a.m. at the latest, she starts to pick red and green peppers. She then labels the peppers with company stickers, stacks them neatly in boxes, and gives them a quick dusting off. Sometimes she helps plant seedlings in the ground. When she’s in the fields, she usually has a bandana around her nose and mouth and wears a long-sleeved sweatshirt with the hood pulled up. She’s all covered up with only her eyes peeking out. Around 3 or 4 p.m., at the end of most of the workers’ day, I’ll often ride with my grandpa in his truck to pick up my grandmother, who also works at the same pepper farm. My mom drives home about an hour later—she’s a foreman, responsible for other workers, and must stay to finish the payroll. 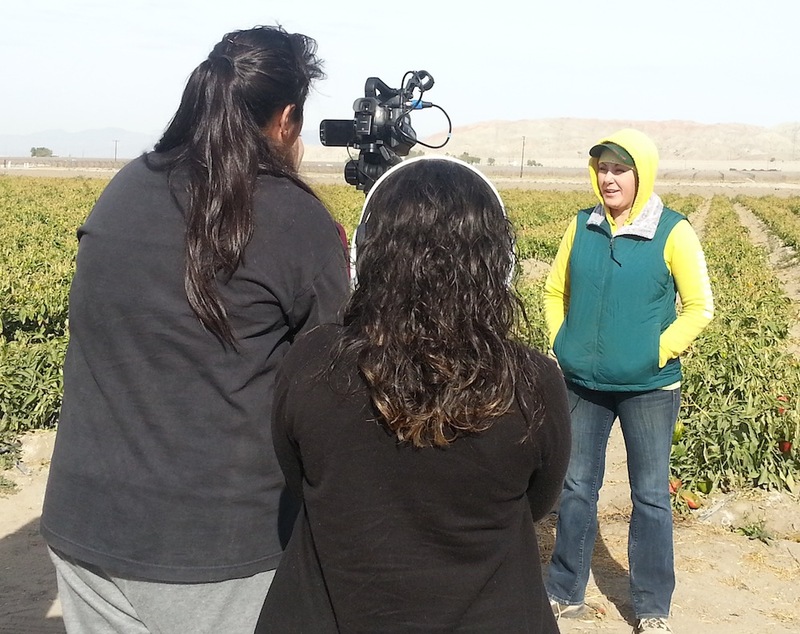 I honestly didn’t think of my mom’s job as interesting until my friends and I signed up for a filmmaking class this past winter break offered by Global Girl Media, a nonprofit that provides high school girls with media and leadership training. We were in a room at Mecca’s Boys & Girls Club, where I’ve been going for about a year and a half (since I was 12) to participate in community service, get homework help, and take boxing lessons. The Global Girl Media teachers asked us if we thought there was anything interesting about our lives that would make a great story. It was hard to think of something. One of the teachers asked me where my mom worked. “That’s a great subject,” she said. My mother, who goes by Mari, immigrated to the United States about 30 years ago when she was in her late teens. My grandparents brought her, my aunt, and my uncles here from Michoacán, Mexico. They immigrated to the United States to find better work. My mother met my father at a dance party when she was around 18 and had my older sister shortly afterward. Since she couldn’t take care of a kid and go to school at the same time, she was unable to get a good education. She started working in agricultural fields at the age of 23, after my dad had to take time off because of an enlarged heart, and the family needed money. She started off picking lemons—and later bell peppers and strawberries—and sometimes did some planting, too. (My dad, who has gotten better, works at the same bell pepper farm my mom ended up at. He is usually spraying chemicals on the fields to get rid of weeds.) In the summer, when it’s too hot to grow anything in the Coachella Valley, my mom and dad find work in the fields of Oxnard or Bakersfield. Sometimes I go with them and we live in small, rented apartments. Sometimes I stay in Coachella with my grandparents. It’s like my mom has two full-time jobs. After she puts in a full day in the fields, she comes home and takes care of the house. She is always mopping, vacuuming, or sweeping. She washes the dishes and waters the plants outside. She cooks enchiladas, taquitos, flautas, and chile rellenos. She grills vegetables and makes rice with beans. Sometimes, I make my own food (microwavable soups) if she’s tired. Sometimes she watches a little TV with my dad. She goes to bed somewhere between 8 and 10 p.m., after the chores are done. About five years ago, my mom found out on visits to her doctor that she had health issues related to her work. She has rashes on her face, arms, and chest that the doctor thinks are related to the pesticides she encounters every day. She was just diagnosed with rheumatoid arthritis, which her doctor said is connected to all the physical farm labor she has done over the years. Even though she just turned 40 a few weeks ago, her entire body hurts all the time—especially her legs and hands. At the end of the day, she just wants to go lie down. The Spanish-language soap operas on Univision—which are often on in our home—portray agricultural workers as poor and dirty objects of fun. I have never been ashamed of what my mom does for work because it’s what allows her to buy my sister and me clothes and food. But I have noticed that some of the younger kids who attend the Boys and Girls Club don’t like being seen with their parents, particularly if their folks are in the dirty sweaters and bandanas that show they’ve come straight from the fields. I had visited my mom in the fields before, but filming her gave me a different point of view. As one of my friends held one of those big TV-news-size cameras, I was asking her questions: What was her job here? How many women work at that farm? What do you want for your kids to be when they grow up? As I watched her label and wipe the peppers with a small towel, I realized that these things she did so effortlessly are the things that make her extremely tired and sick all the time. I knew she worked hard, but I saw this work was really, really hard. I admired her strength and ability to endure all this because she wants my sister and me to have a comfortable life, to go to college, to become whatever we aspire to be in the future. It took a few weeks for those of us in the training course to edit the footage for our three documentaries. Our movies were screened in a mini-film festival at the Boys and Girls Club on International Women’s Day, March 8. My mom didn’t say much during the screening, but afterward, she wanted to show the movie to everybody. In the pepper fields, she’d play it for her co-workers on her phone. Global Girl Media also put the videos up online and showed them on March 22 at the Women Action Media conference at Santa Monica College. I would love it if my video would help spark further conversations about agricultural workers, their pay, and working conditions. But at the very least, making the “Mother/Madre” videos have given me and my friends a chance to see a part of our moms’ lives we don’t see all the time and to tell stories about women who don’t get a lot of attention otherwise. Our mothers are front and center in our lives—and now we can introduce them to everybody else, too. Janelly Martinez is 14 and lives in Coachella, California. *Photos courtesy of Global Girl Media.